This is an absolute beauty of a book – there is no better way to describe it. It speaks to any child disillusioned with their homework, or any child interested in our world, and to anybody who wants to be enchanted by stunning ink and watercolours. Sophie has to write three things about polar bears for her Arctic homework. She’s just not interested and would much rather watch TV. 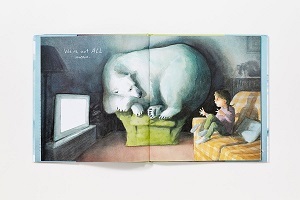 Then a real polar bear appears in her living room, and although she’s shocked, she is amazingly still rather dismissive of him, until he shows her the Arctic for real, not just in pictures. Together they explore the sights and sounds, the landscape and creatures, and once they arrive back home to Sophie’s house, her report knows no bounds – it takes over the living room – pictures plastered all over the television. The selling point for this book is the magnificence and splendour of the illustrations. A slight fuzz obscures the pictures so that you feel as if you are seeing it through a thought bubble, but the expressions on Sophie’s face are so lifelike – so perfect, that you feel you are next to her. 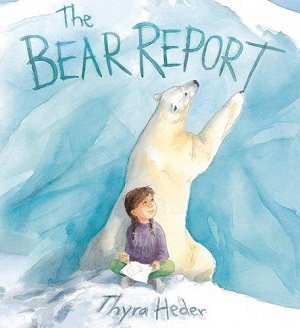 Her frustration at her homework, her amazement when the bear appears (she drops the remote control), her delight at fishing, and then her wonder at the Northern Lights and grit and determination when filling in her report at the end – all are exquisitely drawn – the illustrations in this book speak to perfection. Of course, it also aims to teach about the Arctic – and succeeds, not just in showing its beauty, but also in explaining why polar bears need the ice, what they eat, the importance of whales and their communication, the dangers to the animals there, and the scale and size of it. Sophie’s increasing curiosity and enthusiasm as the book progresses will inspire readers too. An engaging, thought-provoking, and rewarding picture book. Click here to buy.